Each year, Library Journal, “the oldest and most respected publication covering the library field,” selects what it considers to be the most notable government documents, including those produced by the Federal Government. For 2009, 15 Federal Government publications got the nod, and I plan to discuss them here over the next few weeks. According to Library Journal, “This year’s list of Notable Government Documents includes titles on history, government policy, mental and physical health, biology, global warming, and environmental protection, among other topics.” One of the more unusual items is a new edition of Civics Flash Cards for the Naturalization Test, a publication from U.S. Citizenship and Immigration Services (USCIS). This set of 100 questions and answers is used by USCIS officers to administer orally; an applicant will be asked 10 of these. The cards cover the nature and structure of the Constitution, the Federal Government and some basic American history. The questions range from “What is the name of the President of the United States now?” (pretty easy) to “How many amendments does the Constitution have?” (uh-oh). Well, that’s why these cards exist: so someone seeking citizenship can, by practicing, be prepared to take and pass the naturalization test. USCIS deserves credit for putting together such an informative and useful publication. I think it would also make a great study guide for use in schools. 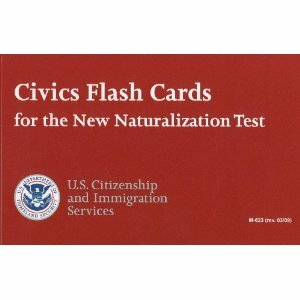 You can purchase the Civics Flash Cards for the Naturalization Test here or view them online here. There’s also a do-it-yourself version here. Note: Many of the questions have more than one correct answer, luckily for me. This entry was posted on Tuesday, May 18th, 2010 at 10:13 am and is filed under U.S. Citizenship and Immigration Services. You can follow any responses to this entry through the RSS 2.0 feed. You can leave a response, or trackback from your own site. It’s great! Thank you GOD and you. While I live United States here,I think I need it as a citizen also. I will be understood America step by step and felt friendly United States more through the civics flash card. Best you could make changes to the page subject Notable Documents 2009: Civics Flash Cards Government Book Talk to more catching for your blog post you make. I liked the blog post still. There is a misspelled word on the answer card on card 126 – representation. One might reasonably claim that the subject of the book no longer seems relevant. With 10 million illegals here and more coming every day, why bother to study and pass a test on American values? Our government really seems to have a double standard in that it supports illegals but makes it difficult for those persons who legitimately want to earn citizenhip. Since you’re discussing government documents from Library Journal, I really think you ought to be citing libraries they can be found in. We’ve got the civics flash cards in my home library. You can see 550 others by visiting http://www.worldcat.org/title/civics-flash-cards-for-the-new-naturalization-test/oclc/320895977. I realize you are trying to highlight items from the GPO bookstore, and that’s a good thing to do. I think you might increase your sales if you emphasize the “try before you buy” aspect of libraries. If it’s just a problem of locating a quick link for holding libraries, just go to OCLC’s WorldCat.org, type in the title, and copy the “permalink” from the record. Despite my harping on the importance of library holdings, I do think you’re selecting great titles for this blog. I think this blog will go quite a ways to show that govdocs are interesting and worth having in your homes. Thanks for the suggestion. I also will check with my liaison on the library side of the house for this information.